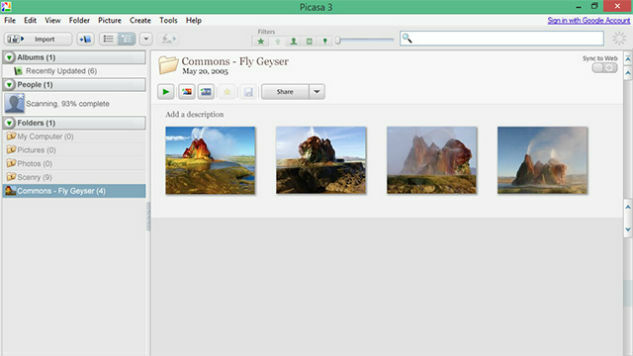 Google recently announced that, starting March 16, it would no longer support the Picasa desktop application. Though Picasa is a well-known photo organizer and editor, Google has had much more success with its newer photo storage and sharing application, Google Photos. Though the program will continue to work if you currently use it, or download it before it’s shutdown next month, Google will not offer future updates. This would be the obvious next choice. The company is already encouraging Picasa users to switch to their newer platform, Google Photos. They have also made it super easy to do so. The company has notified its users that, to access and modify photos they already have stored on Picasa, all they need to do is log into Google Photos, where all their photos and videos will be automatically uploaded. For Windows users refusing to stick with Google, the Windows Live Photo Gallery is probably your best alternative. The set up is similar to Picasa and is a one-source location for editing images and uploading them directly to Facebook, Flickr or other social media sites. It has a lot of easy to do features that Picasa users will be used to-such as rotating photos, resizing images, adding captions and setting a Geo location. If you’re not a fan of Windows or Picasa, check out Zoner Photo Studio. Okay—so this one’s not free, but the software does offer a 30-day free trial and then a $45 Home version or a $65 Pro version. It has a great setup and allows you to download and edit your photos in one place. Plus, you can get more advanced features for editing that you didn’t have in Picasa. Phototheca makes it really easy to manage, organize and sort your photos in one place on your desktop. The company offers a free and paid version, both offering a library for you to import your images to. It also offers a few unique features, such as displaying photos by calendar or in a timeline mode, in addition to standard features, such as slideshows and photo browsing. This program is both a photo management and photo-editing platform designed to allow users to easily and quickly edit photos. You can organize your photos however you want—chronological, color matching, etc.—and easily search for a given photo. Additionally, ACDSee offers editing features, such as applying filters, using drawing and selection tools, reducing red eye and allows you to add borders, vignettes and texts to images.